How are new ideas born? That is, if there is nothing in the mind that was not first in the senses, how does anyone think up anything new? How, in this regime, can we make sense of the mind's creative powers, its ability to think something that has not been thought before? One way of tackling this problem, historically speaking, has been through other processes of generation, especially where something absolutely new, some radical excess, springs from a thing or things already existing. 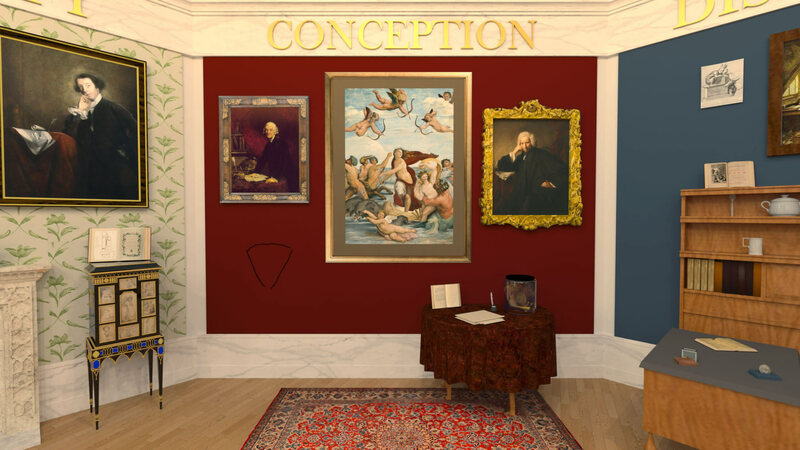 I am talking about conception, here, about human reproduction, in all its mystical glory. For conception, that orphic site of origins, was to become the sublime and destructive desideratum of a surprising constellation of thinkers. This space treats the interbraided careers of three men, whose major projects differently strained at the problems of origins. It is not limited to them; it also touches on others, whose stories can help illuminate the central problem (and its surprising solution). But it mostly focuses on William Hunter, Joshua Reynolds, and Laurence Sterne. An anatomist, a painter, and an author, each differently approached the problem of origins through the figure of human generation, the conception of new ideas through the conception of new life. Each of these men ultimately relied upon an increasing spiral of models and metaphors, especially of absence and blankness, to help their investigations along. That is, in the place of answers-- which would be what, exactly?-- the offered figures. And perhaps this is the only way-- for it goes without saying that conception, understood in the bodily sense, was no more available to these thinkers than was the solution they sought. This is not only because they were all men, seeking their answers (sometimes quite violently) in the bodies of women; it is also because their project was in some important ways frustrated at the very outset. Though he, himself, suggested that "conception" was one of those abstract ideas that sprung from embodied experience, he nevertheless insisted that the mind, like the body, was incapable of making anything new. It could only combine, analyze, and compare. How, then, to conceive, especially how to conceive something new? The exhibits in this space represent efforts to model this impasse; they are objects in quest of conception. “Paper ready to your hand,” a cognitive ecology of the simplest sort. Laurence Sterne, Tristram Shandy (1759–1767). Courtesy William L. Clements Library, University of Michigan. Raphael Sanzio’s fresco at the Villa Farnesina. The Triumph of Galatea signaled a new phase in Raphael's career. Villa Farnesina, Rome © Alinari/Art Resource, N.Y.
Joshua Reynolds has captured William Hunter as he was in life-- installing him, as though in a diorama, among his medical preparations. GLAHA 43793. © The Hunterian, University of Glasgow, 2014. A single folio sheet folded in half, offering a rudimentary illustrated handbook of obstetric anatomy. MS Hunter FH224. Courtesy Special Collections Department, University of Glasgow. An image of a fetus at five weeks, from William Hunter and Jan van Rymsdyk's Anatomia uteri humani gravidi tabulis illustrata (London, 1774), plate 34.1. Courtesy Special Collections, University of California, Los Angeles. Joshua Reynolds, Laurence Sterne. Sterne has either just finished, or just conceived, his brainchild and magnum opus, Tristram Shandy. NPG 5019 (c) National Portrait Gallery, London.